Why have an ELP (Environmental Literacy Plan)? An Environmental Literacy Plan provides a unified and collaborative framework for organizations, agencies, schools, businesses and individuals to help Massachusetts sustain the natural environment. Implementing an Environmental Literacy Plan for the Commonwealth will enable our citizens to have the knowledge, skills, and resources to shape a more sustainable and prosperous future for our state. 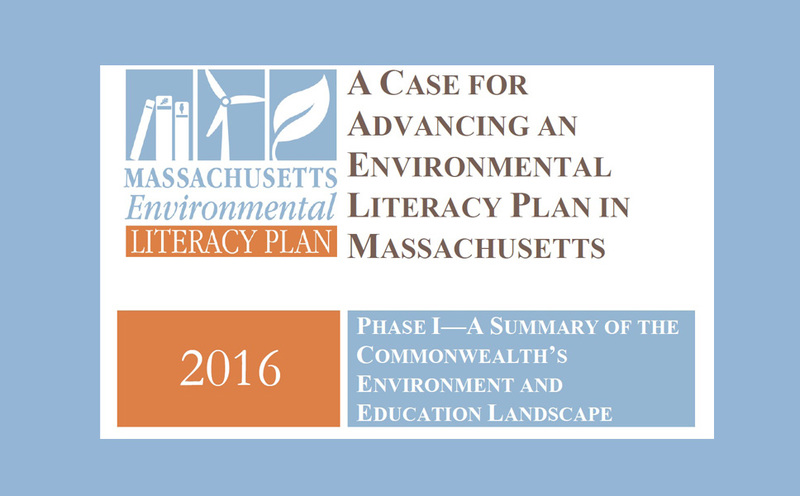 We are excited to announce the release of Phase 1: A Case for Advancing an Environmental Literacy Plan in Massachusetts. Click here to view the document. Massachusetts residents will develop an understanding of the interconnected relationship between community, economy and the environment. They will have an appreciation of the impacts their choices and actions have on others, locally and globally, and the natural systems that support our lives. Residents of the Commonwealth will make environmentally responsible choices regarding complex issues that affect the environment, their families and communities, and the world beyond our state. Citizens will act to help the state achieve a healthy balance between the needs of human societies and the natural world through education, innovation, and stewardship, all with an environmental ethic. Residents of Massachusetts will have positive personal connections with the rest of the natural world – they will become environmentally literate citizens of the Commonwealth. • Developmentally appropriate environmental education will be well integrated across the Pre-K-12 curriculum, including the new state science and other standards. • Higher education will provide a similarly appropriate and integrated curriculum, have opportunities for environmentally-related research, and prepare students for environmental and STEM-focused careers. • Teacher training and professional development programs for all educators will integrate environmental literacy goals. • Career programs will offer job training specifically in environmentally-relevant and STEM -relevant fields, as well as integrate environmental-related components in a wide range of jobs not directly related to the environment. • Informal learning environments such as after-school, camps, museums, zoos, and aquariums will enhance and promote environmental literacy. • Businesses, government agencies, and NGOs, will consider and strive for positive environmental impacts in every decision, policy, or initiative they undertake. One of the ultimate goals for states working on ELPs is to get them adopted by their state Department of Education so that environmental education (EE) is integrated into the curriculum in every public school across that state. How amazing would that be! As you all know, taking kids outside to learn has so many benefits even beyond building an appreciation for the environment and a greater understanding of ecological processes. Research shows that environmental education improves student achievement in core subject areas, gets them more engaged in learning, improves behavior, and so much more. As indicated in the North American Association for Environmental Education’s ELP Status report, ELPs give teachers and students new opportunities to take learning outside; explore their communities; analyze issues; learn about connections between our economy, society, and environment; support economic growth; and become engaged citizens. This is the very goal that MEES is working towards. Let’s get EE in every public and private school in MA!!! Please understand that the intent of this effort is NOT to make a bunch of new standards for teachers to address and test to, but rather, to have them use the outdoors to teach to those standards and subjects that are already required at their schools. Is this the entire purpose of the Mass ELP? No, our state has a more comprehensive approach to our ELP than many other states. THIS IS EXCITING!! Not only are we hoping our children grow up to be environmentally literate, we want adults to be able to make informed decisions for their families, homes, and communities and for businesses to embrace best practices that protect our natural resources. We will need a lot of help but, once complete, the Mass ELP could serve as a model to other states that have not completed theirs yet and want to take a similar approach. This is an impressive undertaking for the Commonwealth that will hopefully help guide other states across our country. Luckily, others are working on these efforts so MEES is focused on environmental literacy for pre-K through 12th grade and teacher professional development. You can help by sending us your stories so we can share them across the state and beyond. Help MEES build a map of environmental education programs around the Commonwealth. Take Action for Environmental Literacy Today! What your students enjoy most about it and how it has had an impact on them. Please send us photos that you have photo releases/permission to use. We prefer high resolution jpgs so we can include them in press releases. Please send us any videos you have of your program. We prefer videos in a windows based platform such as media player. Please email everything to MEES’ ELP representative, Kim Botelho at kbotelho@mariamitchell.org. For large videos or many photos, please contact her for drop box details. We can’t wait to hear your stories! !